I was fortunate enough to receive from Influenster these strips to test out. I am always skeptical about anything that claims to whiten teeth. I have tried products in the past and they let me down. I have sensitive teeth so usually whitening products bother me. Not so with the Crest 3D White Professional Effects Whitestrips. They are really easy to use. You apply once a day for 30 minutes. That's it. Nothing complicated. They were gentle on my teeth and within a few days I saw a noticeable difference in the color of my teeth. 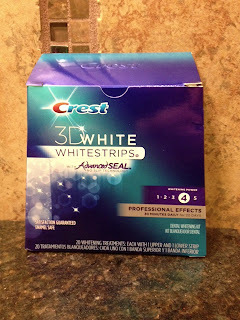 I used them the full 20 days and was incredibly surprised and impressed with how great my teeth looked. I would definitely use these again and highly recommend that you give this product a try if you are looking for something that gives immediate results.